Currently using opioids such as heroin or prescription pain medications? Abstinent from opioid use, but have used in the past? A friend or family member of someone who currently uses opioids? Interest in learning how to save lives? If you answered YES to any of these, please consider attending a no-cost REVIVE! 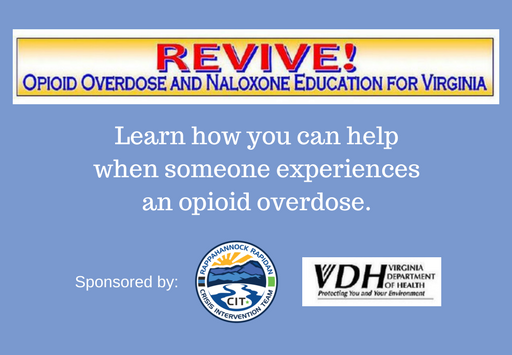 training event offered by the Crisis Intervention Team at RRCS and the Virginia Department of Health. 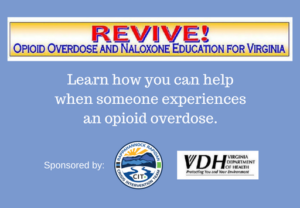 FREE Naloxone is provided to anyone who completes the workshop. Tuesday, April 23, 2019 – 6:00pm to 8:00pm at Madison Rescue Squad, 1473 N. Main Street, Madison, VA 22727 — To register, click HERE. Wednesday, May 29, 2019 – 6:00pm to 8:00pm at Warrenton Volunteer Fire Dept., 167 W. Shirley Avenue, Warrenton, VA 20186 — To register, click HERE. There is no charge to attend this training, but pre-registration is required. Training is offered on a regular basis throughout the community. All training events start at 6:00pm and end at 8:00pm. Dates and locations are announced on our website (www.rrcsb.org) and our Facebook page (www.facebook.com/rrcsb).